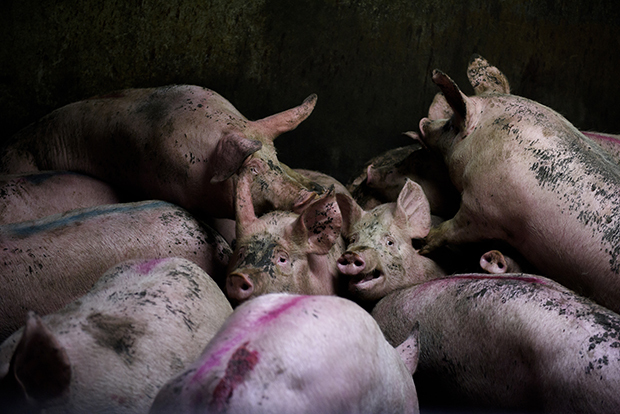 For a photographer, there is a degree of risk that comes with exposing these activities; in parts of the United States, for example, “ag-gag” laws prohibit and punish the documentation and investigation of the conditions in industrial farms. Activists and journalists alike face the possibility of being targeted by big business with a stake in the industry, and Garmendia explains that most activists must use hidden cameras in order to gain access to farms and slaughterhouses. At different points throughout his career, the photographer has had to use false identities. He embarked on this project with help from local activists, who formulated a plan of action and supported him along the way. The horse slaughterhouses were the most difficult to approach given a negative public view on horse meat, but Garmendia reports that 70% of the equines killed for meat in Mexico come from the United States. Once inside these locations, Garmendia witnessed firsthand the widespread practices of animal slaughter; some killings were done legally, and many were not. I ask him if he was ever able to show any of these animals any gesture of compassion or comfort in their final moments. “No,” he replies simply. “That could put all my work at risk.” For an undercover photojournalist, even subtle signs of dissension can be dangerous. He wasn’t able to touch or interact with any of these animals, but the act of being there was, in and of itself, an act of great kindness, and we would all do well to follow his lead. As difficult as these images are, I hope you’ll spend time with them and remember them long after you look away. 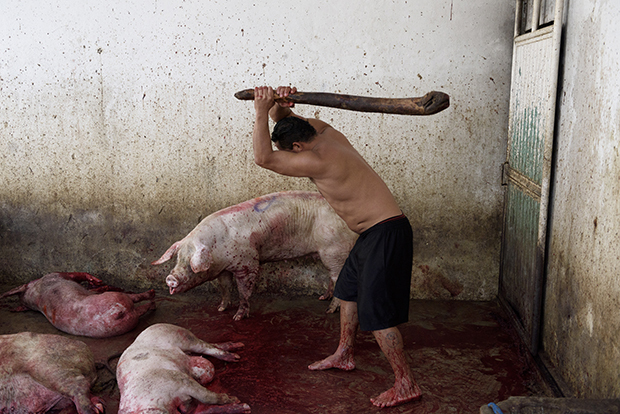 An operator prepares to hit a pig with a club in a slaughterhouse owned by the government in Arriaga, Mexico. This way the animal is immobilized and facilitates the task of bleeding, but remains conscious. This practice is prohibited. 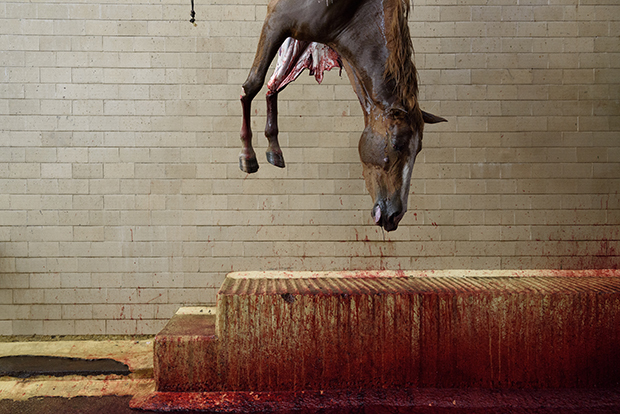 Horse slaughterhouse in Arriaga, Mexico. 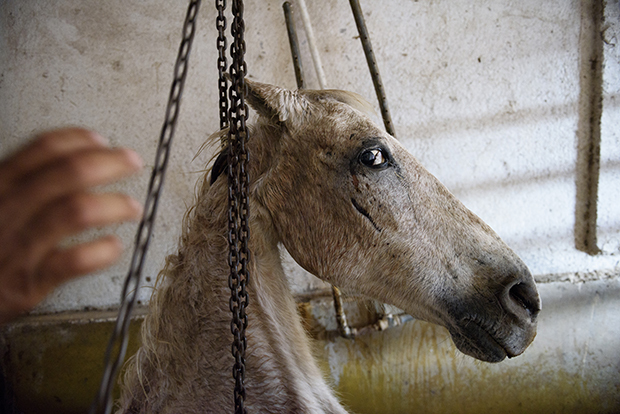 Mexico is the third largest producer of horse meat in the world. 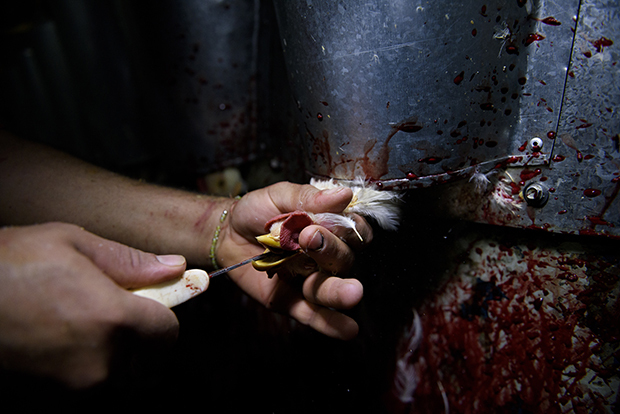 A chicken is slaughtered without prior stunning in a small family slaughterhouse in Izucar de Matamoros, Mexico. 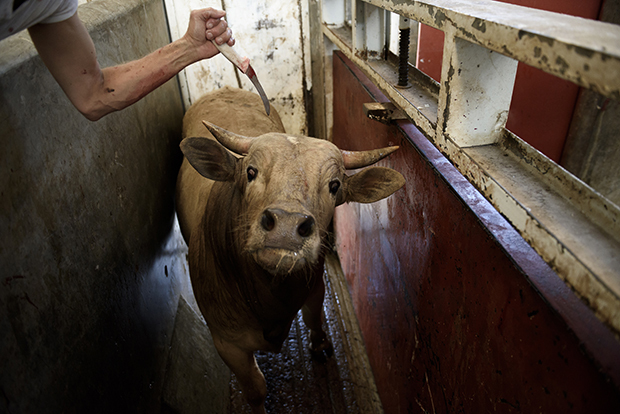 The law expressly prohibits the slaughter of animals without first having been stunned. In this slaughterhouse in Jalisco, Mexico, they use a blade that they insert into the spinal cord of the cows in order to immobilize them. It is not always effective on the first attempt and may require several stabs before they collapse. This method is done to keep them immobile and expedite the task of slaughtering by the operator, but the animal remains conscious. It is a practice prohibited by law. 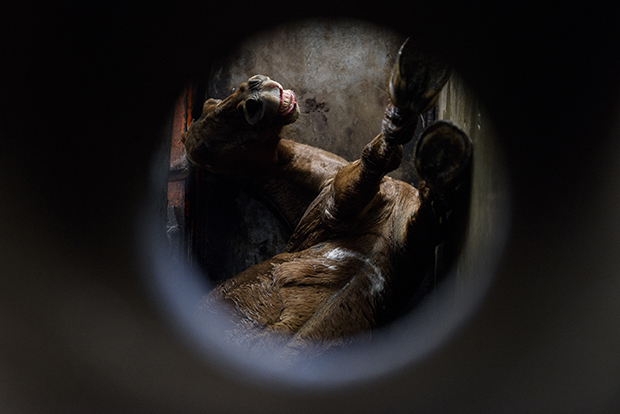 In this slaughterhouse located in the town of Arriaga, Mexico, the horses were stunned by electric shock for several days due to a breakdown in the captive bolt gun. It is a practice prohibited by law. 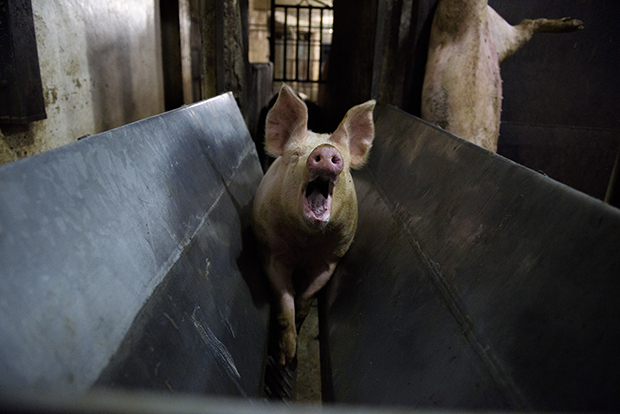 A pig after being receiving an electric discharge in a slaughterhouse in Oaxaca de Juarez, Mexico. In electric stunning, special pincers equipped with two electrodes located at their ends are placed on both sides of the animal’s head and transmit an electric shock. If done correctly – something that does not always happen – an epileptic seizure is caused and, consequently, momentary loss of consciousness. This method is reversible, i.e. : even in cases where the process is carried out correctly, the animal regains consciousness in a short time. After the slaughter, the heads and legs belonging to each animal are grouped for sale in a slaughterhouse in Izucar de Matamoros, Mexico. 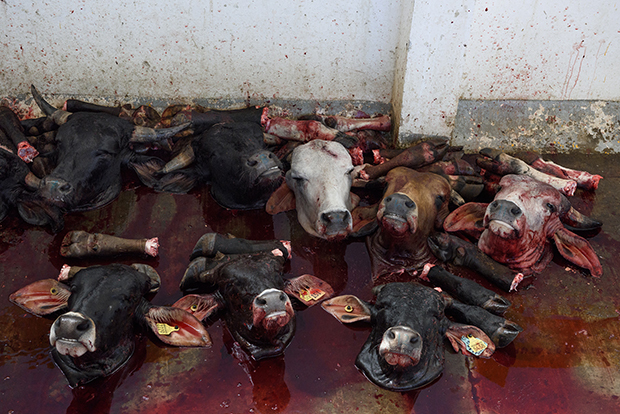 Scenes like this are common in many other slaughterhouses.